Rhino Carbon Fiber is a patented carbon fiber system that repairs bowed and cracked basement and foundation walls by connecting the foundation base with the house or building framing. As a result, this makes Rhino Carbon Fiber the strongest system on the market, and the only solution to be considered for bowed or cracked basement wall repairs. 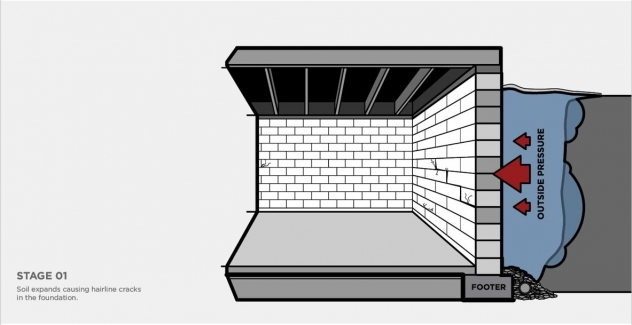 One of the most difficult challenges a homeowner or business may face is an unstable basement. Bowed or cracked walls caused by uneven foundations can create significant damage if left unchecked over time. 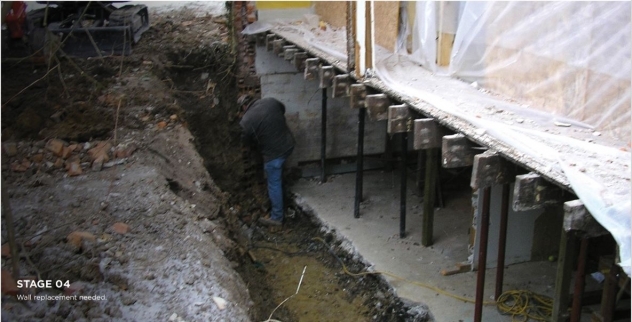 Unstable soils are typically the cause of basement damage, but there is a way to once again stabilize the foundation, repair bowed or cracked basement walls and make the building structurally sound again, saving owners thousands of dollars in the process. If left unattended, this situation will get worse with time, putting both the structural integrity and resale value of the property at risk. Repair is critical. To understand how Rhino Carbon Fiber Wall Supports work, it’s best to first understand how the damage began and what the stages are. The first stage of damage, as illustrated in the image above, is soil expansion and cracks. Soil expands, likely due to unstable soil such as expansive clay or foundation soil that wasn’t compacted properly to begin with. Unfortunately, most homeowners don’t even see this damage. If they do, many will mistakenly assume these are cosmetic cracks and do nothing to address them. Left alone, over time, damage can and will get worse. Stage two of wall damage is when those previously noted hairline cracks increase in size. As a result, the soil shifts and with it, so do basements walls, causing a severe inward movement, also known as bowed walls. Clay backfill in particular will swell as it becomes saturated with water which in turn creates pressure. Unfortunately, that pressure will likely be directed towards the foundation wall, which causes the bowing. Other causes for bowed walls include poor construction or water pressure. Bowed walls are commonly seen in older homes due to years of repetitive freeze and thaw cycles and soil settlement. damage to follow. Also known as shear slide, if not corrected, the foundation wall will eventually fail affecting the structural integrity of the home. If your basement walls are at the point of shear slide, you have little choice but to replace the wall and make it structurally sound again. Part of this process is to link the foundation base with the house framing to restore structural stability. This is when it’s best to consider Rhino Carbon Fiber Wall Supports for your project. While Rhino isn’t the only solution for wall repairs, it’s definitely the best and most cost effective. Below are how Rhino Carbon Fiber Wall Supports stack up against other repair options. Similar to carbon fiber plates, carbon fibers sheets also do not connect to the sill plate or floor, leaving open the risk for future movement. In additional carbon fiber sheets provide no horizontal strength to the walls, which can also prove to be disastrous in the long run. Though cosmetically appealing because they are installed in larger sheets, covering a larger area of the wall, these sheets are actually a detriment as they are messy to install and don’t require any kind of custom installation, running the risk of inferior work when installed. Similar to the two solutions above, this product provides no attachment at the floor or sill plate so again, the risk of future damage when additional movement occurs is great. Unlike other wall repair solutions, Rhino provides a link from the foundation base to the framing of the building, protecting against future movement and pressure. As illustrated above, a galvanized bracket is used to secure the carbon fiber to the sill plate, which is secured to the foundation wall with a carbon fiber pin. Unlike most other systems, the carbon fiber system is secured to the foundation wall allowing for an even distribution of outside pressure, reducing the risk of future damage. 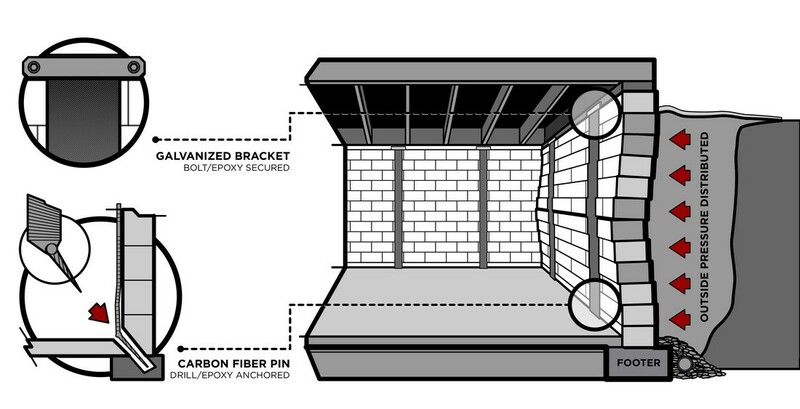 The superior materials used in Rhino Carbon Fiber Wall Supports provide extra piece of mind with installation. In addition, it create a smooth, flat finish that can easily be painted or finished. For homes or businesses that need wall repairs due to bowing, Rhino Carbon Fiber is able to noninvasively repair damage which has occurred over time. If you need help with your wall damage situation, contact Concrete Chiropractor today.